Very cool to be included in the article and the video. Happy Wednesday! That's very interesting - well done! Enjoy your Wednesday. Congrats! Thanks for stopping by! Happy WW! What a great cause and such a cute photo! Thanks for sharing the article! Such a wonderful contribution. So glad the News featured the story. Tell Lulu Hi and Great Job!! That looks like a lot of fun was had by all and for such a great cause. Hey Lulu, Jet here. Hi Miss Christie. Thank you ever so much for sharing this walk, article and video. Mom asked me to share that she had not thought of that aspect of domestic violence. What a vital cause and wonderful new resource. We will have to see if we have such a facility in Miami Dade. Please let me know what you find out. I'm really curious. I know this shelter is one of the few in the country and the only one in Central Florida. 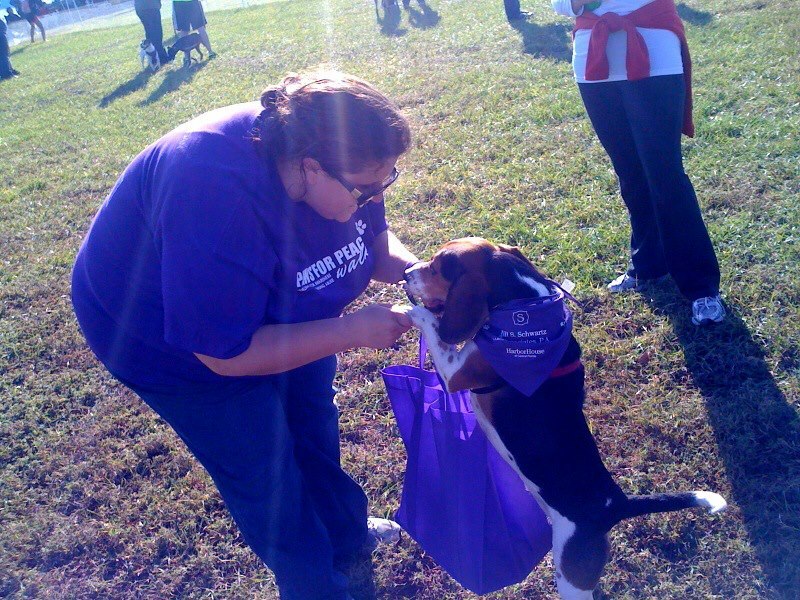 We like the idea of combining fitness for you and your dog with helping great causes. Glad you had a good time on the walk. Yeah, I think we're gonna try and do more walks if we can. Great article, great cause--wonderful you for helping out! Were there lots of goodies in that bag?